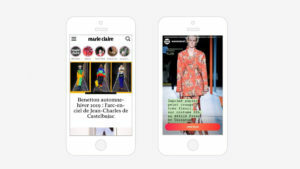 ADYOULIKE, the leading native technology platform, has today [Wednesday 10 April, 2019] announced the launch of Native Stories, a new mobile advertising format, in exclusive partnership with GMC Media, part of the Marie Claire Group. “Thanks to our technological know-how, we are committed to restoring a balance between what “walled gardens” can offer and what our premium publishers can offer from the “Open Web” and as always helping publishers to generate as much value as possible for their media brand, by themselves and for themselves, primarily on their own sites. The arrival of Native Stories on the open web marks a major paradigm shift in that the advertising experience is now fully integrated with the content. This is the ultimate evolution of Native Advertising that we wanted to achieve and that is now a reality,” added Yohan.